Pair of architectural metal lounge chairs, modernist design, wonderful patina, amazing design. Hand delivery avail to NYC or anywhere from Bflo NY. Classic Mid Century Modern Highback Lounge Chairs in the manner of Harvey Probber. Extremely comfortable,Superior quality and construction. Retains original fabric. 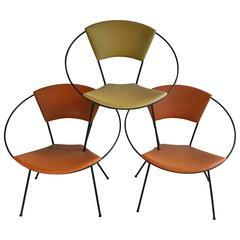 Classic modernist, set of three matching wire iron 'Hoop' garden chairs. Retain original naughyde fabric upholstery and black iron in great condition, great colors, patina.